The forty-first ancestor in my 52-week challenge is my paternal great-great grandfather, Frank F BRAATZ. According to his obituary, he was born 17 April 1867 in Bavaria, Germany, though there is some confusion as to where in Germany the Braatz family is from. His parents has listed birthplaces in other parts of the country. He immigrated to Wisconsin in June 1868 with his parents, Wilhelm and Maria (Klegin) Braatz. In the 1870 census, his family’s first after arriving, they lived in Caledonia, Waupaca County, Wisconsin. 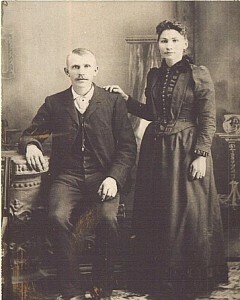 In June 1891, he married Margaret STEARNS in Bear Creek, Outagamie County, Wisconsin. From then until 1898, they lived in Waupaca, Waupaca County, Wisconsin. In 1900, he was working at a Tannery and living in Philips, Price County, Wisconsin. In 1903, my great-grandmother, Agnes Braatz, was born in Mellen, Ashland County, Wisconsin. The family seemed to move around a lot as they were living way deep into the upper peninsula of Michigan in Munising, Alger County from about 1911 to 1919. Frank seemed to settle down a bit after he moved back to Ashland County in 1919, living in that area for the rest of his life, working on his farm. He passed away on 10 July 1948 after a short illness at 81. He is buried at Mount Hope Cemetery in Ashland, Wisconsin. 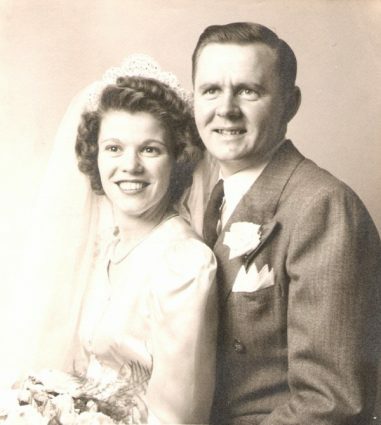 This post is 41 of 52 in the “52 Ancestors in 52 Weeks” Challenge” begun by Amy Johnson Crow. The thirteenth ancestor in my 52 week challenge is my paternal 3rd-great-grandmother, Maria (KLEGIN) BRAATZ. The only documented evidence that I have seen of Maria’s birth was from her death certificate which states that she was born 15 Februrary 1842 in Schoenwalde, Germany. Trouble is that there is no modern city with that name and multiple historical cities with that name. Some basic research from other experts suggests that it may be somewhere in the northern area of Germany, as Klegin is a somewhat rare surname. Though, I also don’t know how solid the evidence is that her surname is actually Klegin as that is also from her death certificate, so it was given by a third party. A glimmer of hope, though, is that her son, my great-great-grandfather, Frank Braatz is listed as having been born in Bavaria, Germany. I did a search for Schoenwalde and Bavaria and it turns out that there is a municipality in Bavaria named Schönwald. I may be on to something. She married Wilhelm BRAATZ at some point, probably the mid 1860s, and gave birth to their first child (and my ancestor) Frank. Shortly after, they decided to leave Germany and head to Wisconsin. On 15 June 1868, they arrived in New York aboard the Ship Auguste traveling from Bremen, Germany. They first settled in New London in Waupaca County, Wisconsin where their next child, William, was born. Next, their third and final child, Ida, was born. They seemed to have stayed in Waupaca County as Maria passed away there in March 1890 and is buried there at Little Wolf Cemetery. Mysteriously, I lose Wilhelm after 1880. I’m assuming he passed away and is also buried there, but I have yet to find documentation on that. I think the photo at the right is a photo of Wilhelm, Maria, and Frank as the photo was in a frame that my grandmother had. It was also labeled something like “Grandma and Grandpa Braatz” assuming it was originally in the possession of my great-grandmother as they look nothing like my grandmother’s Braatz grandparents. 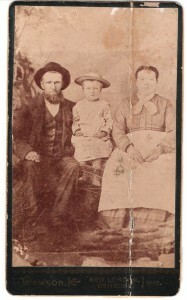 It’s also labeled as being taken in a studio in the New London/Oshkosh area of Wisconsin, where the Braatz family lived for quite awhile. 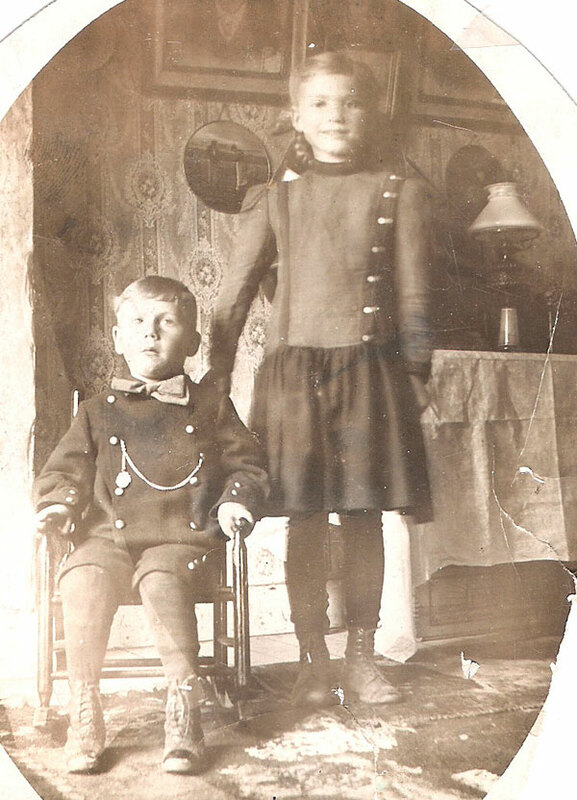 This post is 13 of 52 in the “52 Ancestors in 52 Weeks” Challenge” begun by Amy Johnson Crow. 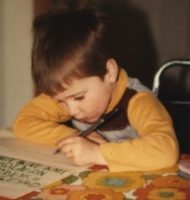 It’s time for another one of Randy Seaver’s Saturday Night Genealogy Fun posts. List your matrilineal line – your mother, her mother, etc. back to the first identifiable mother. Note: this line is how your mitochondrial DNA was passed to you! Tell us if you have had your mitochondrial DNA tested, and if so, which Haplogroup you are in. Post your responses on your own blog post, in Comments to this blog post, or in a Status line on Facebook or in your Stream at Google Plus. If you have done this before, please do your father’s matrilineal line, or your grandfather’s matrilineal line, or your spouse’s matriliuneal line. Does this list spur you to find distant cousins that might share one of your matrilineal lines? According to my blog, it seems I did this line for myself already. Though, I will post it again in case something is more up-to-date. I will do my father’s line and also my wife’s line since I haven’t really inspected those before. Here is mine, first. Unfortunately, my matrilineal line is one of the few lines in my tree that is somewhat short, though I have not done a ton of research on it. I have done a DNA test, so I do have my mtDNA information. According to the latest 23AndMe info, my Maternal Haplogroup in H11a. I have made my 23AndMe Maternal Line page public, so you can view more details there. 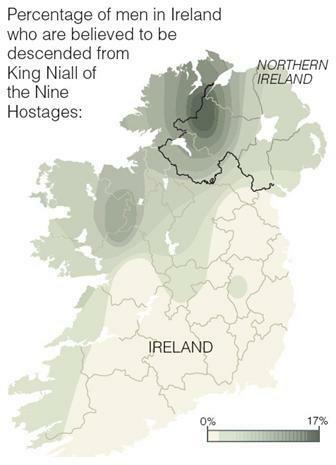 It does match the German ancestry that I find in my research. Next is my father’s matrilineal line, though there is no mtDNA haplogroup info since my DNA does not have that information. Only his DNA (or his sibling’s) would show that. A photo of my great-grandmother, Agnes (BRAATZ) CORRIGAN. 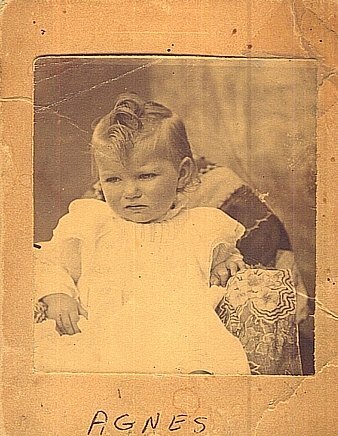 If I had to take a guess, I’d say the photo was taken around 1904-05 since she looks to be about 1-2 years old. The history in my family tree for this week. As always you can browse the dates yourself on the Dates & Anniversaries page. 1939 – Died – Anna A (LINDNER) ZALEWSKI – Anna is my great-great-grandmother on my father’s side. She was born 27 Nov 1865 in German Poland. She married Frank J ZALEWSKI in 1885 and emigrated to America in 1889, settling in Milwaukee. Frank and Anna had 9 children together. Anna passed away in Milwaukee at the age of 73 and is buried with her family at Holy Cross Cemetery in Milwaukee. 1923 – Married – Maurice Earl CORRIGAN & Agnes Katherine BRAATZ – Maurice and Agnes are my great-grandparents on my father’s side. Maurice was born 28 Dec 1898 in Sanborn, Ashland Co., Wisconsin and Agnes was born 4 Feb 1903 in Mellen, Ashland Co., Wisconsin. They were married at Iron Mountain, Dickinson Co., Michigan and had 5 children. Maurice passed away in 1993 and Agnes in 1998. They are buried at St. Agnes Cemetery in Ashland, Wisconsin. 1856 – Died – Jacobus Franciscus KREBBEKX – Jacobus is my 4th-great-grandfather on my mother’s side. He was born 1 Mar 1818 in Hoofdplaat, Zeeland, Netherlands. He married Maria Sophia SCHALLOIR in 1840 and together they had 2 children. Jacobus passed away at Hoofdplaat, Zeeland, Netherlands. 1867 – Born – Frank F BRAATZ, Sr – Frank is my great-great-grandfather on my father’s side. He was born in Germany to Wilhelm & Maria (KLEGIN) BRAATZ before immigrating in about 1867. 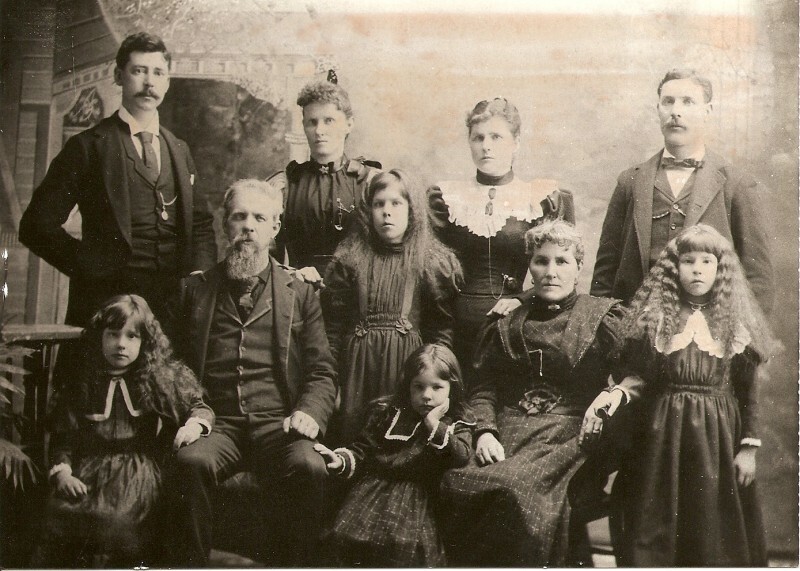 Frank married Margaret K STEARNS in 1891 and had 5 children, including my great-grandmother Agnes. Frank passed away on 10 Jul 1948 in Ashland, Wisconsin and is buried there at Mt. Hope Cemetery. This photo was found in my grandmother’s collection and labeled “great-grandparents Braatz” which should make this couple, Wilhelm & Maria (KLEGIN) BRAATZ, my 3rd-great-grandparents on my father’s side. The child is not labeled, but I’m assuming it’s my great-great-grandfather, Frank BRAATZ, since he is their first child. I would also assume the photo was taken sometime in 1870 or so. This is a photo of my great-grandmother, Agnes (BRAATZ) CORRIGAN and her younger brother, Frank BRAATZ, Jr. There is no date on the photo, but if I had to guess I’d say it’s probably in 1910-11 or so.